What’s high tea if you don’t have some traditional English treats. I’ve always been fascinated with Queen Victoria, not sure why, just one of those very odd interests people sometimes have in life. In 1840 the originator of afternoon tea, Anna Maria Stanhope, the 7th Duchess of Bedford, was a lady-in-waiting to Queen Victoria. She created Afternoon tea to ease the grumbling tummies of polite society in the mid-afternoon. With lunch at noon and dinner at 8pm, mid-afternoon was a perfect time for a mid-day tea with light sandwiches. 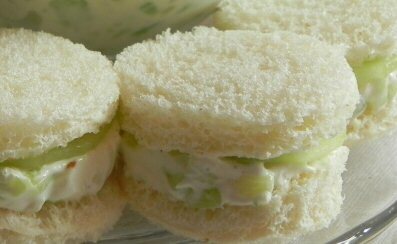 One of the most common or traditional tea time sandwiches has always been the cucumber sandwich. Because these are designed to be small, they’re created more for flavor than nutrition. This is my recipe, it’s plain and simple and nothing like the long involved preparation of a traditional cucumber sandwich. So if you’re looking for a traditional cucumber sandwich, this is not it. In a large bowl, combine cream cheese and dressing or dressing mix. Mix thoroughly. Add salt to taste and mix again. Dice the cucumbers into small squares and add to the dressing mix. Combine thoroughly. Cut your bread slices into small squares, rectangles, or use a small cookie cutter for some fun shapes. Each sandwich should be about 2 inches in diameter or 2 inches square etc. Place 1 tblspn of cucumber dressing mix on a slice and top with the remaining bread. Cut a tomato into small ¼ inch squares to add flavor and color to your sandwich. Cut an onion into small squares to add flavor, but don’t add both tomato and onion. Use any type of your favorite dressing to spice up the flavor, such as Italian or French. Save yourself some time by purchasing small tea sandwich loaves at your local deli.